A few things stood out at Hooch's first medical exam. The dog's ears had been freshly, brutally, shorn off. He was severely emaciated. And desperately thirsty. But the hell that Hooch came from only became most apparent when he opened his mouth. Nothing. His tongue had been sliced off at the very base. "Everyone was mortified," Amy Klein of Marley's Mutts, the rescue that pulled the dog from a southern California shelter two years ago, tells The Dodo. It explained why Hooch was so perilously thin. He didn't have a tongue to move the food in his mouth. And he appeared unable to even take in water. 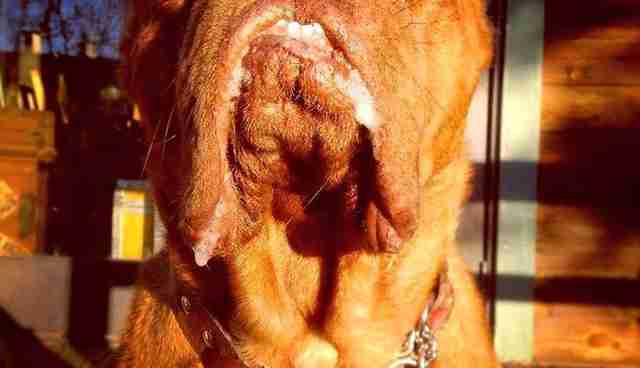 So how do you get lifesaving nourishment to a dog with no tongue? "They were trying to figure out a way to feed the poor guy," Klein recalls. "They put a feeding tube in his neck, but he kept ripping it out." They even tried a Bailey chair - a customized seat that props up dogs so gravity can pull down the food. Nothing worked. Until a veterinary technician named Andrea Bertolucci came up with a simple idea. It only required trusting an unknown dog who had just been pulled from a bad situation. 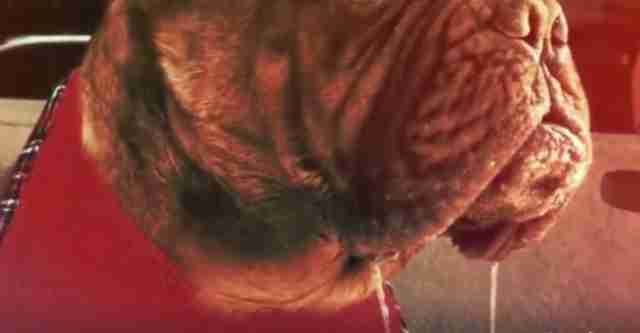 Bertolucci took a piece of kibble and reached deep into Hooch's throat. "She had no fear," Klein says. "She would put her hand into his mouth - into the back of his throat - and then drop it down." Hooch allowed gravity and a healthy helping of faith to take care of the rest. Hydrating Hooch proved a little less ... delicate. "He just submerged his face in a bucket of water," Klein explains. From there, Hooch simply sucked it up. 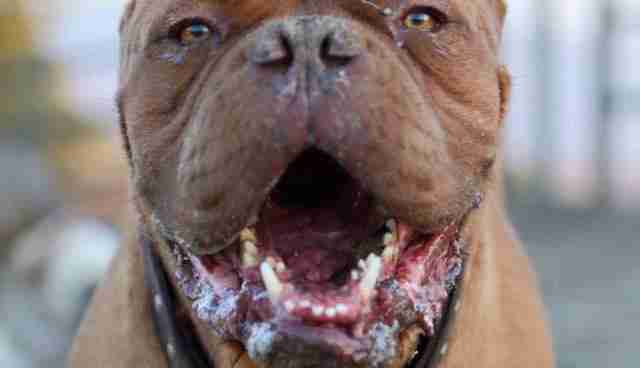 But his condition left another lingering detail that's obvious to everyone Hooch meets. "He drools all the time. Not just water. He can't swallow saliva," Klein says. 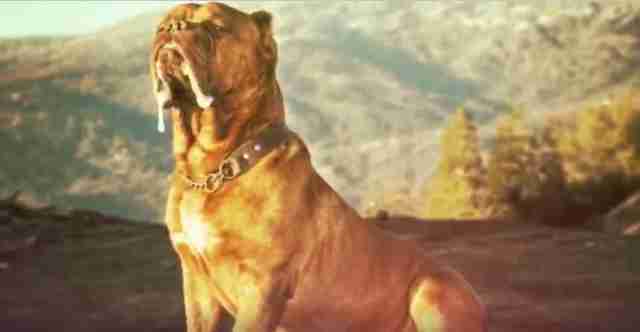 But Hooch would have more serious issues than boatloads of drool. "He has to stay indoors most of the time in the summer because he overheats and he can't regulate his own body temperature by panting," Klein explains. Kisses are also impossible. But he's really good at hugs. 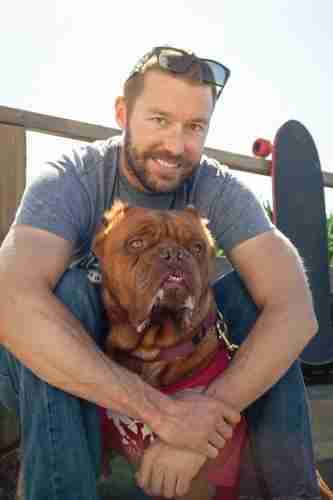 So good, in fact, that after he was adopted by Zach Skow, the founder of Marley's Mutts, Hooch blossomed as a therapy dog. Today, kids with autism flock to "the big orange bear" when he visits them. His mile-wide grin lights up elementary schools and community centers. "He lays there and lets the kids crawl all over him," Klein says. "He's just the sweetest dog ever." Indeed, the dog with no tongue has still managed to find his voice. And it's proven a resounding one. 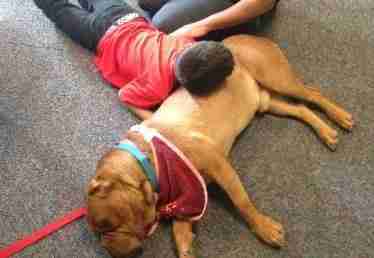 Hooch spends regular time with children and even among people struggling with homelessness and addiction. "He does every kind of program you can imagine," Klein says. It's all added up to a kind of stardom among therapy dogs. This year, he's being recognized for it. 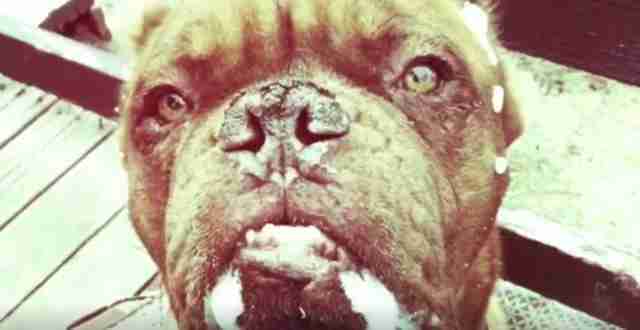 The American Humane Association has named Hooch one of eight finalists for a coveted Hero Award. But for all his newfound fans, Hooch has never forgotten the hand that feeds him. Today, he dutifully leans his head back while Skow gently eases a handful of kibble down his throat. He still hoovers water from a bucket. And spreads his saliva with reckless abandon. But make no mistake. This is the slobbery face of a hero. If you would like to support Marley's Mutts and its mission to save countless dogs like Hooch, consider making a donation here.